Concrete Core Drilling is a construction service that utilizes a large drill to remove a cylinder of material or a core. After scanning the concrete with ground-penetrating radar, core drilling may be implemented wherever it is safe to do so. Concrete core drilling is a service that requires highly-skilled professionals who are well-versed in working with concrete and the safety precautions that come with it. Concrete Core Drilling of the most effective ways to create openings for plumbing, HVAC, electrical and sprinkler systems. Fine Cut can drill holes of various sizes in diameter. Regardless of the area, our trained operators can core drill inside and outside. If you were going to try to do Concrete Core Drilling, it is impossible without the necessary tools and equipment being kept in optimal condition. You would have to put safety first and watch out for debris and particulates which could easily strike you and get caught in your eyes or lungs. Protecting your face and your mouth is especially important to protect yourself from choking on the dust that flies up from the drill once it is turned on. Fine Cut knows the importance of safety and always puts safety first on every job. Some smaller drilling projects require hand-held drills that can drill holes up to three inches in diameter. For larger drilling jobs, a drill stand or rig-mounted drill is required. Larger projects that require more powerful drills should be handled by a professional. Working with concrete can be very dangerous; don’t put yourself in any unnecessary danger. Let professionals like Fine Cut do the work for you. Precision is so important because you can avoid potential accidents from hitting something hidden under the concrete. Fine Cut knows to drill into the location they have marked out for drilling. Fine Cut is also able to cut into other things like core drill through structural concrete, asphalt, stone, brick and cinder block. Our team can core drill floors, ceilings, walls, floor and roof drains, sewer drains, phone, electrical, cable and fiber optic openings. We core drill for pipe bollard installation, handrail and anchor holes and even fireplace exhaust systems. 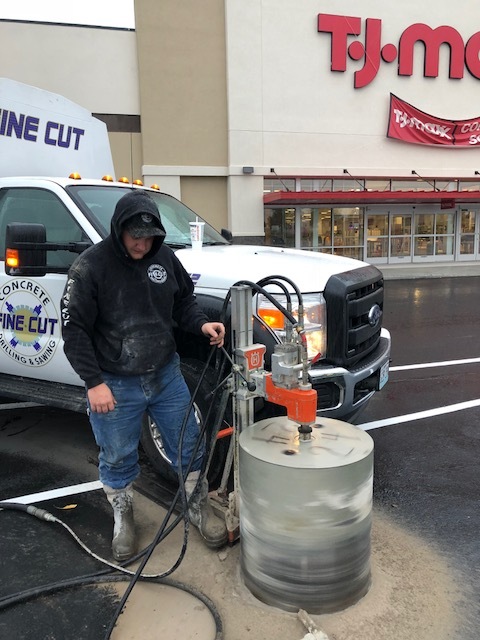 When it comes to Concrete Core Drilling, save time and money and use a professional company like Fine Cut. 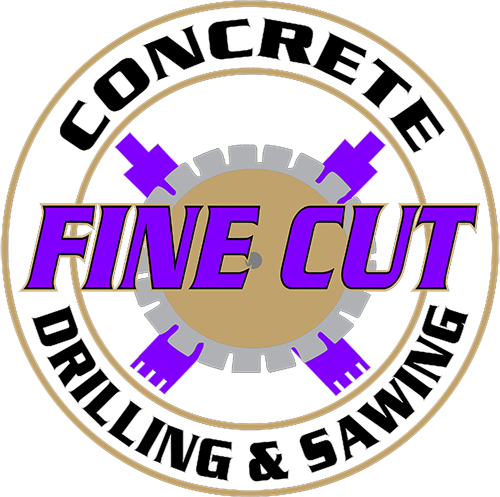 To learn more about Concrete Core Drilling and other services Fine Cut offers, call (816) 540-5787. Customers continue to choose Fine Cut for their distinguished reputation in the concrete drilling and sawing industry.